On 9 June 1988, the Samoa post office issued a new postage stamp commemorating the arrival of the first Latter-day Saint missionaries in Samoa one hundred years ago. The three-dollar stamp depicts the Apia Samoa Temple. Souvenir sheets showing the islands of Savai’i, Upolu, and Tutuila, along with a reproduction of the stamp, have also been issued. Arrows show the route of the first missionaries. 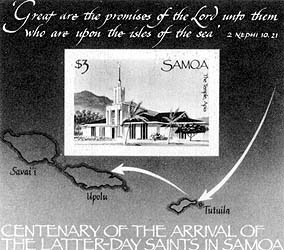 Along with a new stamp picturing the Apia Samoa Temple, Samoa has issued souvenir sheets showing the route of the first missionaries.